South Orange, New Jersey: Once again, rumors have circulated on social media regarding a Chipotle Mexican Grill location coming to Downtown South Orange. 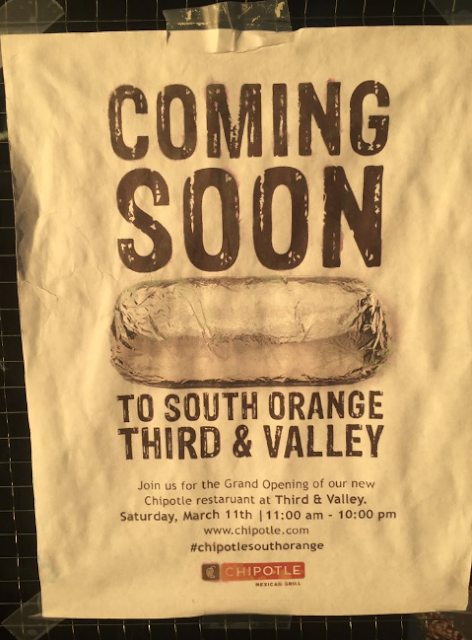 "I've been waiting for the South Orange Chipotle since the day I was born", tweeted one user. A flyer was created this week advertising a new Chipotle 'restaruant' at the recently completed Third & Valley development at 153 Valley Street. The flyer claims that a grand opening celebration will be held on Saturday, March 11th. However, officials tell Essex County Place that there are no plans for a Chipotle in the Village. "I saw it myself tonight", said Bob Zuckerman of the South Orange Village Center Alliance, referring to the flyer. "It is indeed fraudulent", he added. Danielle Moore, Chipotle's Public Relations and Communications Manager, told Essex County Place that the company does not discuss new restaurant locations until a lease is signed and construction has been scheduled. Two years ago, a fake flyer was created advertising a new Chipotle restaurant at The Gateway on West South Orange Avenue. The only Chipotle locations in Essex County are in West Orange and Newark, and the only business currently slated for Third & Valley is Artistry Salon.